It’s very stereotypical for a writer to struggle to find motivation to do just that, write. So in an effort to force myself to write more regularly, I’ve decided to introduce the capsule review. These will be brief, quick-hit reviews of movies I’ve seen recently. It’s a simple concept, you don’t need any more explanation than that — let’s get to it. In a GQ cover story on First Man, writer Daniel Riley points out that the film’s version of the Apollo 11 moon landing could very well become the “definitive, superseding account in the minds of many Americans.” Kind of like how if you’ve seen Saving Private Ryan, those are the images you have in your head of D-Day. Or Titanic for the sinking of the Titanic. Or Apollo 13 for that failed near-disaster mission. (As far as I know, astronaut Jim Lovell looks exactly like Tom Hanks.) For director Damien Chazelle and star Ryan Gosling (who plays Neil Armstrong), it had to be a daunting task creating the audiovisual experience of man’s first trip to the moon that will be imprinted on the public consciousness. I’d say they landed the Eagle with aplomb. 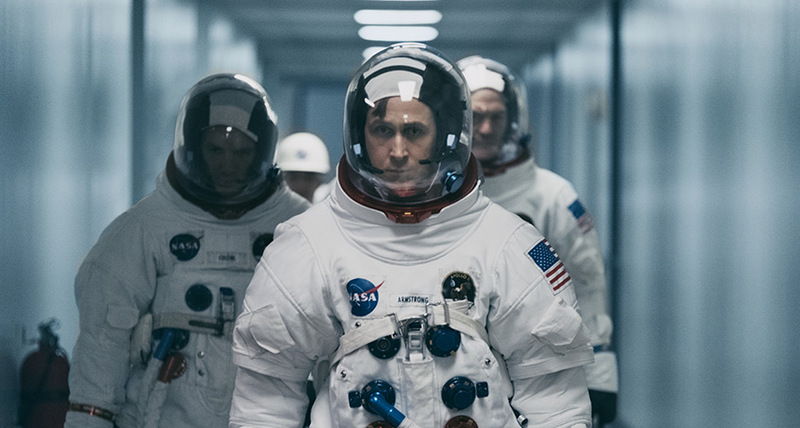 First Man is an intimate and immersive look at both Neil Armstrong’s life and how we were able to get a crew of astronauts all the way to the moon’s surface in 1969. Chazelle’s movie is stern and tight-lipped, much like its protagonist. Gosling’s performance as the iconic Armstrong is perfectly restrained and tightly wound due to the death of his two-year-old daughter several years before Apollo 11, which the film postulates was a motivating force for Armstrong in his drive to make history in such an ambitious but perilous way. Even with this emotional heft, however, it wouldn’t be unreasonable to find the film a tad cold because of how closely it mirrors Gosling’s performance. This is no triumphant “U-S-A!” picture. And yet, I found it moving all the same. Claire Foy can be thanked for much of this, as she impressively brings Neil’s wife Janet Armstrong to life. It’s a smaller role, but feels very authentic to what an astronaut’s wife must have gone through: the all-too-common funerals and the creeping notion that your loved one could be next. As for the rest of the cast, it’s a That Guy all-star team: Shea Whigham, Lukas Haas, Corey Stoll, Jason Clarke, among others. He may be too famous to be a That Guy, but Kyle Chandler is great as always here. Already the youngest Best Director winner ever, Chazelle finds a new way to shoot a space movie on First Man. During the flight sequences, he keeps us locked inside that claustrophobic cockpit, only occasionally allowing us to breathe with a wide shot. The shuttle launches are white-knuckle, hair-raising experiences where literally everything shakes onscreen, as if you’re right there next to Armstrong. It makes you consider how crazy we had to be to pull this off 50 years ago. And please, Academy, give whoever designed the impeccable sound here an award or three. You can hear every quaking piece of metal as the astronauts hurtle through the sky in these fragile tin cans. While most of the film is shot in 16mm shaky-cam and extreme close-up, the moon sequence (shot with IMAX cameras) is absolutely stunning. When Armstrong and Buzz Aldrin open up the hatch, all the sound is stripped away and we are left with what Aldrin famously called that “magnificent desolation.” Moments like this are exactly why we go to the movies.